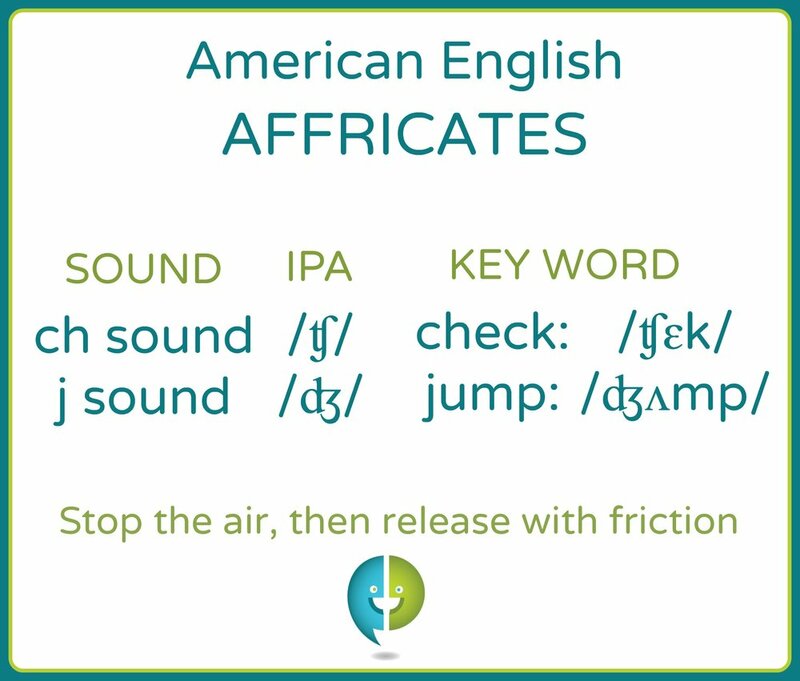 The English affricates, the 'ch sound' /ʧ/ and 'j sound' /ʤ/ are two-part consonant sounds. They begin by fully stopping the air from leaving the vocal tract (similar to a stop sound), then releasing it through a constricted opening. (similar to a fricative sound). The International Phonetic Alphabet symbols nicely show that /ʧ/ begins similar to a /t/ and is released similar to an 'sh sound' /ʃ/. The corresponding /ʤ/ begins similar to a /d/ and is released similar to a 'zh sound' /ʒ/. Listen to and practice the /ʧ/ and /ʤ/. The 'ch sound' /ʧ/ is an unvoiced consonant (the vocal cords do not vibrate during its pronunciation) and the 'j sound' /ʤ/ is a voiced consonant (the vocal cords do vibrate during its pronunciation). The vowel sound before an unvoiced consonant sound has a shorter duration than the vowel sound before its voiced counterpart. This tiny change in vowel duration helps listeners of English determine which sound was spoken. Some specialized dictionaries will use a colon-like symbol of stacked triangles /ː/ to note a vowel with increased duration. Notice the difference in vowel duration in the following minimal pairs. The word with the unvoiced consonant is first.